One of the things that I have most wanted to experience since living in Holland is ‘Wintersport’. The Dutch (and most Europeans, actually) are crazy about skiing and snowboarding. Holland, however, is pretty much devoid of any hills. In fact, most of the place is actually below sea level. That doesn’t make for great ski conditions so the Dutch–whose work to vacation ratio seems close to 1:1–often take about a week off during the winter months and drive anywhere from 8-14 hours to some snow paradise in the mountains of Austria, France or Italy where they ski, drink, eat, and generally lounge around. Obviously, I wanted in on this tradition. 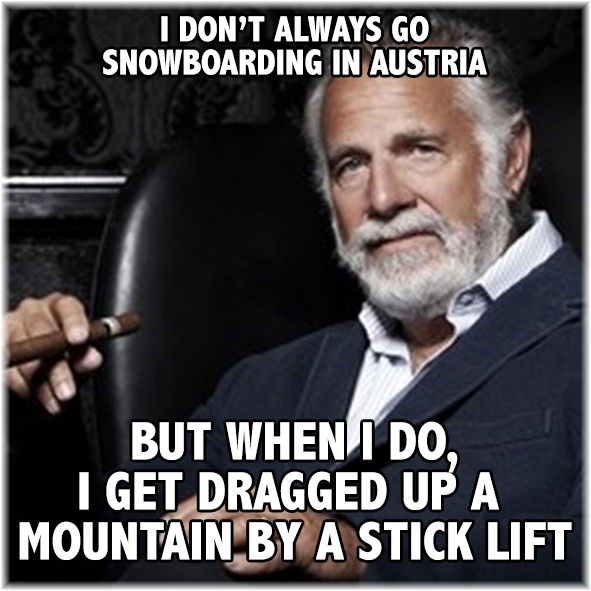 And while I do not purport to be an expert snowboarder or even above average, I am confident in my modest boarding skills and was very excited at the chance to test them out in the Austrian Alps. Excited but realistic, I was also a little nervous to be on a real mountain for the first time. The ski resorts of upstate New York and central Pennsylvania that I learned on max out around 2,000 feet high. A couple weeks ago I rode a chair lift up a mountain to about 6,000 feet. The snowboarding wasn’t much different than what I was used to. The chair lifts were even easier to manage via smaller inclines and a slow down mechanism just before exit. What was NOT easier to manage was the so called, T-bar lift. It is, as the name suggests, shaped like a T but an upside-down one; so more like an anchor, really. If you have ever experienced this particular method of moving from the bottom of a ski slope to the top of it, you know that it requires a certain level of coordination. While this is not a trait that I lack completely, it is probably safe to say that it wouldn’t be in my top 5. In my defense, these things are pretty tricky for snowboarders. Skiers essentially just sit down on it with their skis pointing up the hill. Easy enough. A snowboarder can’t do this because the board will be perpendicular to the hill and that just won’t work. A boarder has to stand sideways and out of the way, then grab the bar as it’s moving by and thrust it between the legs so that it hooks the front leg and initiates the drag up the hill. Shockingly (or not), I couldn’t really picture this when my friends (both skiers) tried to explain it to me and since it was so late in the season, there weren’t many people around and therefore no snowboarders that I could watch as an example. What I took from the directions was ‘grab it and stick it between your legs’. Hmm…ok, I’ll try that.